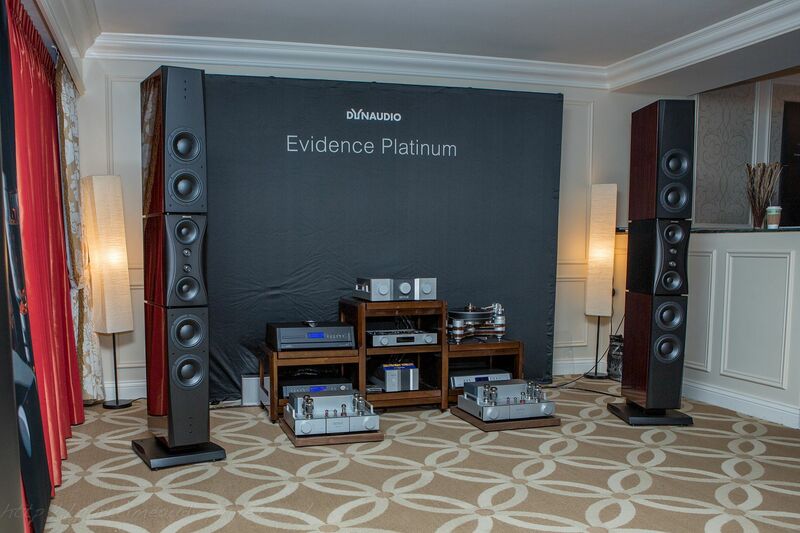 The Evidence Platinum from Dynaudio is ... big. It's also chock full of technology. So much so, that you could write a book about it. I know this because someone already did. I'm holding it in my hand. It has lots of pages. I'm not going to reprint them here. You're welcome. You’re probably wondering whether I liked this system. The answer to this, and many other questions, is “yes”. Like it, I did. Deep bass was a challenge — the same challenge for the vast majority of rooms at the Venetian — but mid-bass and up was all rich burled wood, elegant silver and carved crystal. As it should be, for that price. Pardon me while I lean on the analogy a bit more — this pair of speaker columns struck me as elegant. Like “old-money” elegant. They’re also much larger than they appear in photos — they’re taller than I am — and they’ll stake out a serious position in any room, but at the same time, they’re not going to overwhelm the space, like a YG or a Wilson might. They’re there. Like a menhir. All you need is a center channel that lays across them, and you have Audio Stonehenge. Of course, I jest. A center channel that big is impractical. [Cough]. With eight drivers per channel, expect to set w – a – a – a – y back for optimal listening. 10′ is probably the nearest I’d get, but I’d be looking more for 12′-15′, at least. Intimate, they’re not. But then at this price, that’s probably not what you’re after. My one nit? Something this big, and this costly, really ought to have bass that measures cleanly down to 20Hz or lower. That lack here is a flag. But, that aside, I’m impressed. I’ve seen quite a few speakers in this price point and of that set, a very few actually strike me, visually, as something I’d like to own. This is one. I remember listening to the Evidence Master, the predecessor to this guy. Bass was definitely not a problem, although I didn’t have any test material with me that was <25Hz. The Confidence range on the other hand IS bass light, though otherwise extremely impressive. I've never found the Esostar tweeters to be overly spot-lit or annoyingly bright. It's a fairly forgiving tweeter, much more so than the Accuton ceramic and certainly more than most Be tweeters. It seems that I have the impression from those that have heard Dynaudio is that they are too detailed, to the point of annoyance. Most likely not true, but I do tend to read that take on Dyn. They are also quite pricey. FWIW, that isn’t my experience … but I can’t argue with about the price. That Evidence Platinum is most definitely expensive. Dynaudio needs to install a couple of 15″ side firing woofers with plate amps then your comments regarding the lack of bass would be moot..